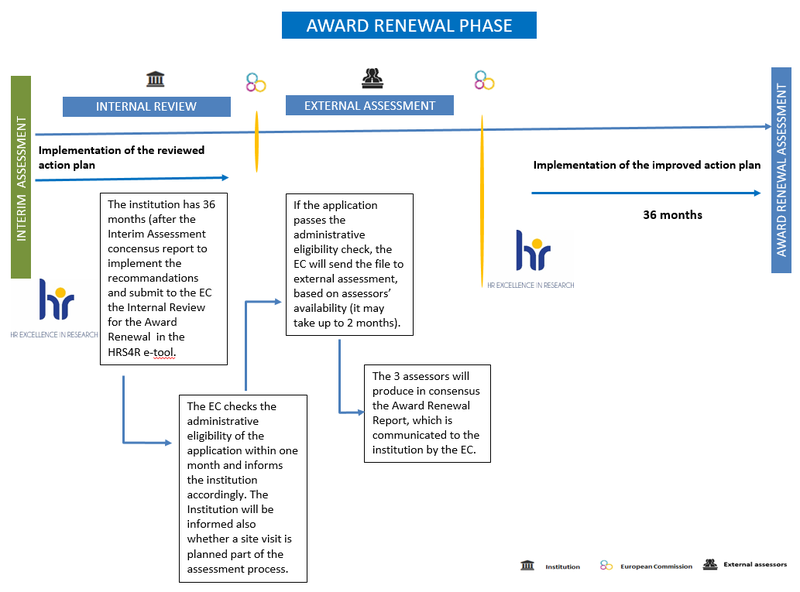 After the applicant institution receives the consensus report with the outcome of the Interim Assessment, it will continue the implementation of the reviewed/improved action plan based on the recommendations provided by assessors and will report to the European Commission on the progress within the next 36 months. The HRS4R process will continue in a cyclical way, with new Internal Reviews every 36 months for Award Renewal (alternating the organisation of site visits). For detailed information regarding the use of the HRS4R e-tool for the Internal Review for Award Renewal, please consult the technical guidelines below. N.B. The institution will have access to the consensus report within approximately three months after the confirmation of the administrative eligibility check. In case a site visit is planned, the period may be longer. Visit the Policy Library to access experts’ reports and download the template for the Internal Review. Preparing the Internal Review for the Interim Assessment? Find details here on how to proceed.